Researchers Ira Winder and Nina Lutz presented the Tactile Matrix at the IEEE Future Technologies Conference and won the award for Best Project Demonstration. 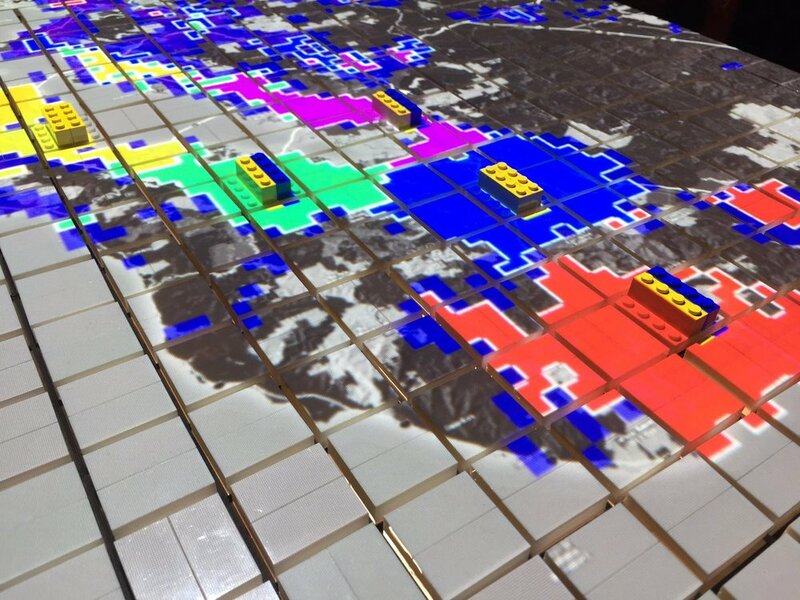 The Tactile Matrix is an open source system for a machine-readable matrix of objects that performs real-time computation and dynamic projection-mapping for projects like CityScope, Finding Places, CityFusion, and PharmaScope. The work covers nearly four years of cumulative research. The proliferation of projection mapping and computer vision techniques have made it possible to create a multiplicity of dynamic, illuminated environments that adapt to user intervention. This paper describes a unique system for an illuminated, machine-readable matrix of objects that performs real-time computation and dynamic projection-mapping. Illuminated, tangible-interactive matrices have immediate applications as collaborative computation tools for users who want to leverage matrix-based mathematical modeling techniques within a friendly and accessible environment. The system is designed as an open source kit of both off-the-shelf items (such as Lego) and components that are inexpensively fabricated with standard equipment (such as laser cutters). This paper outlines (i) a system of hardware and software for the tangible-interactive matrix, (ii) case study applications of the tangible interactive matrix in various disciplines such as urban planning and logistics, and (iii) discussion of possible directions for future research and experimental design. Case Study Implementations of the Tactile Matrix presented at 2017 IEEE Future Technologies Conference. Diagram by Nina Lutz and Joyce Chen. Ira is a Research Scientist at MIT. He is also an alum from MIT Departments of Architecture (BSAD '10) and Urban Studies & Planning (MCP '13). Nina is an MIT junior majoring in Computer Science and minoring in Architecture. This work would not be possible without advice and input from Kent Larson, Grady Sain, Karthik Patanjali, Christoph Reinhart, Cody Rose, Edgar Blanco, Matthias Winkenbach, Daniel Merchan, Brandon Martin-Anderson, Mike Winder, Hafencity University, and many others. Many thanks to Processing Foundation for making and maintaining the tools that were largely used for prototype implementation, and to all of our collaborators for having the faith to adopt our system and methodology. Special thanks to Jie Qi for her feed back and assistance during the 2017 FTC conference.